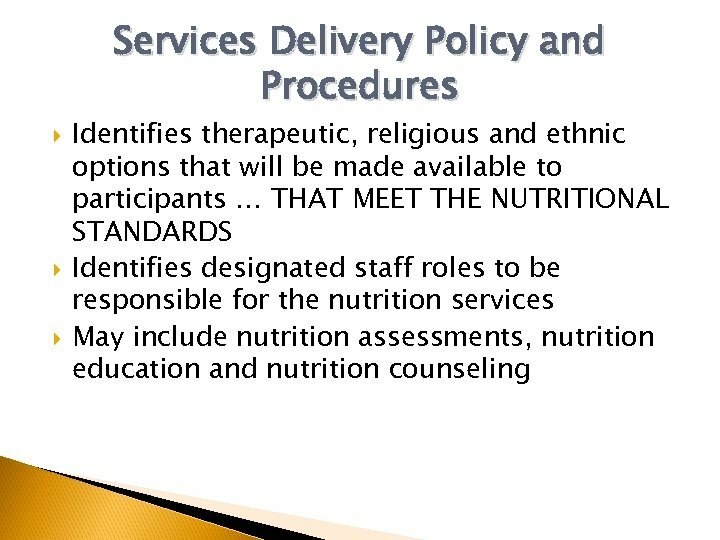 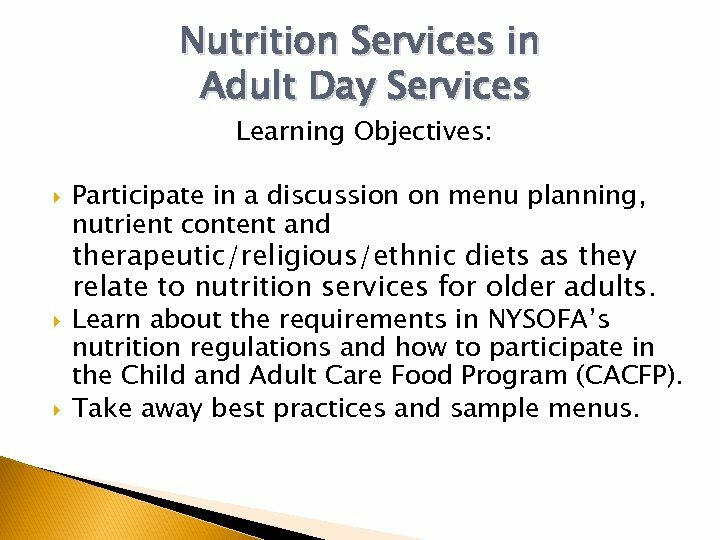 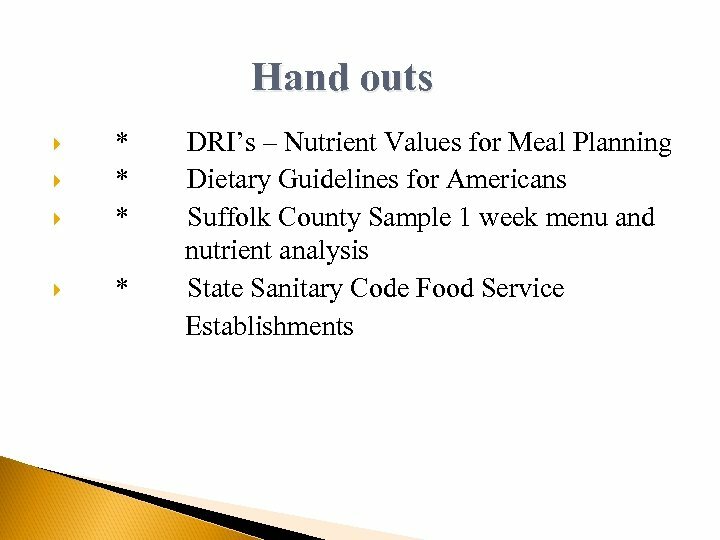 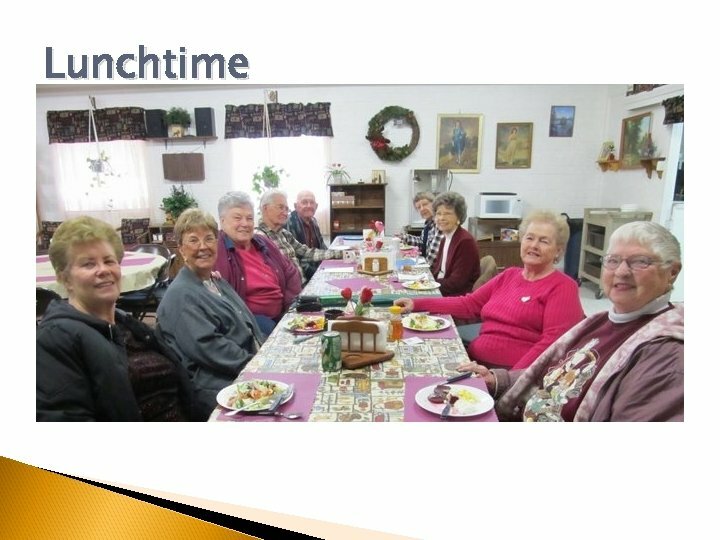 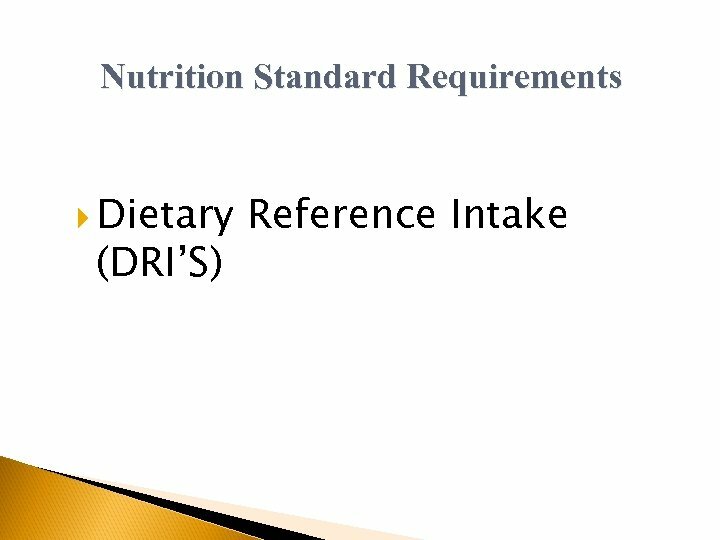 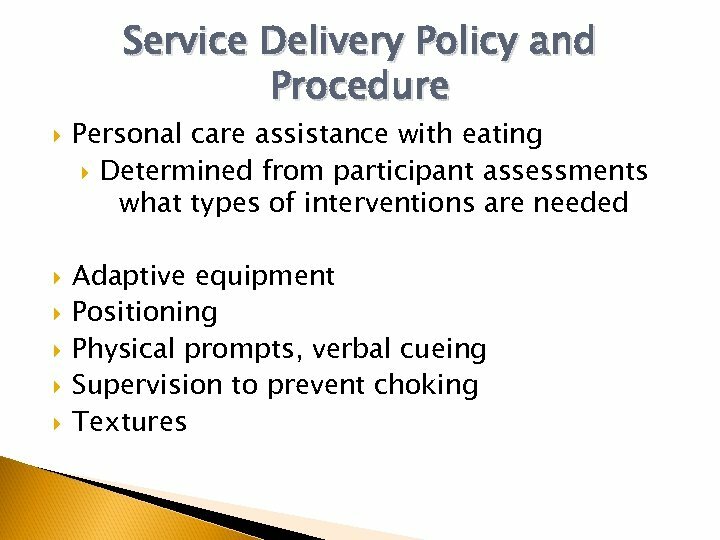 Nutrition Services in Adult Day Services Learning Objectives: Participate in a discussion on menu planning, nutrient content and therapeutic/religious/ethnic diets as they relate to nutrition services for older adults. 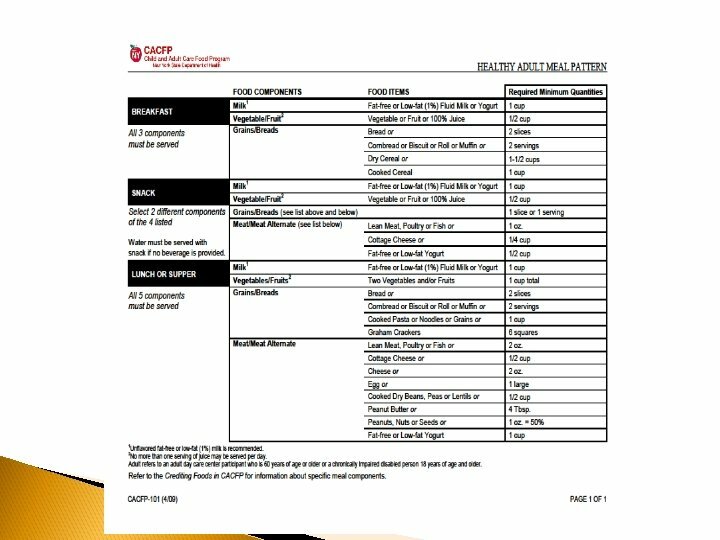 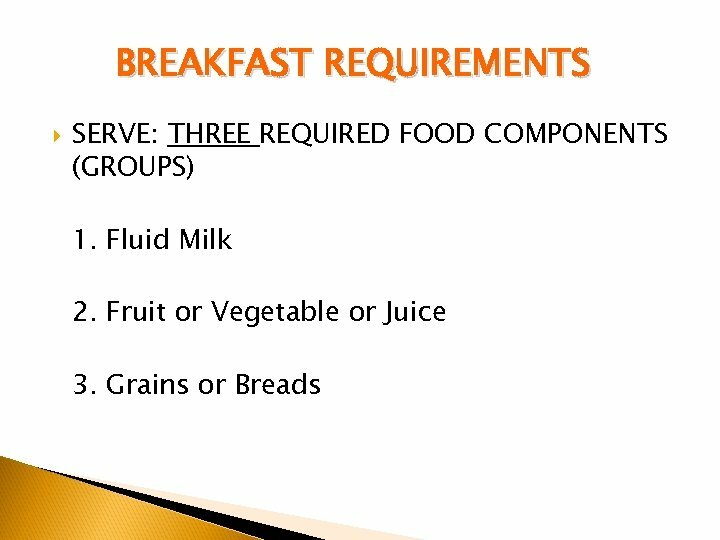 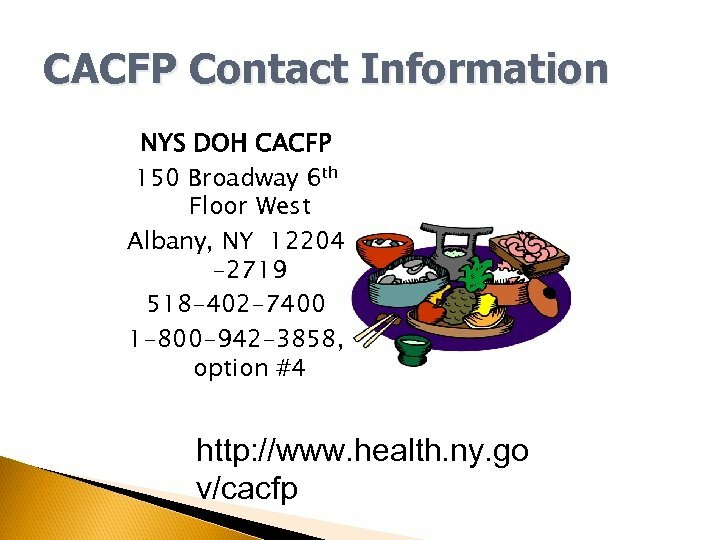 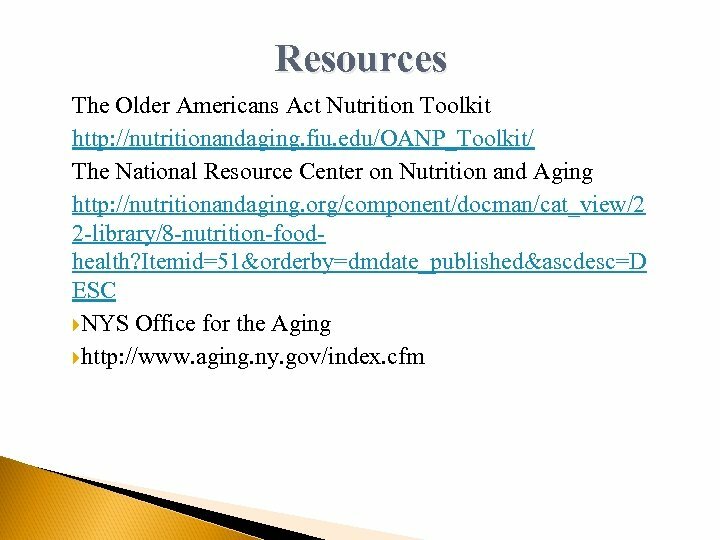 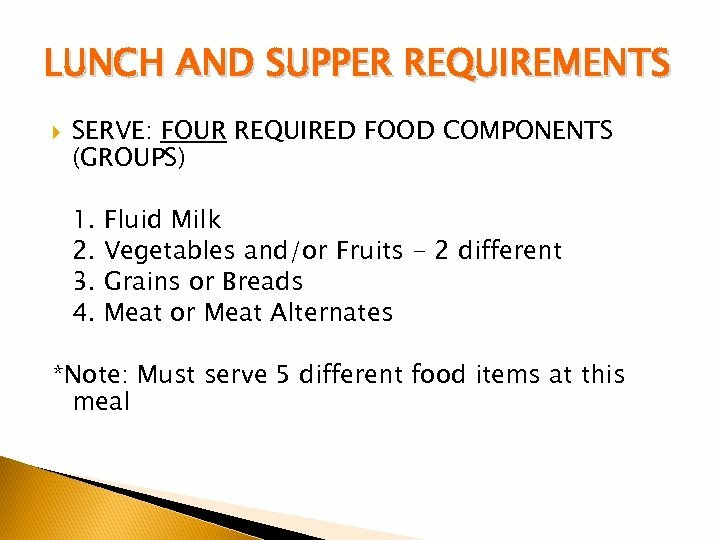 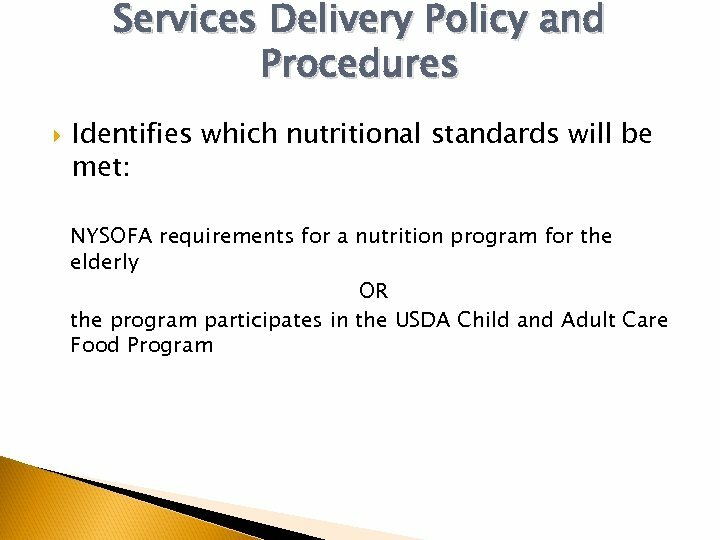 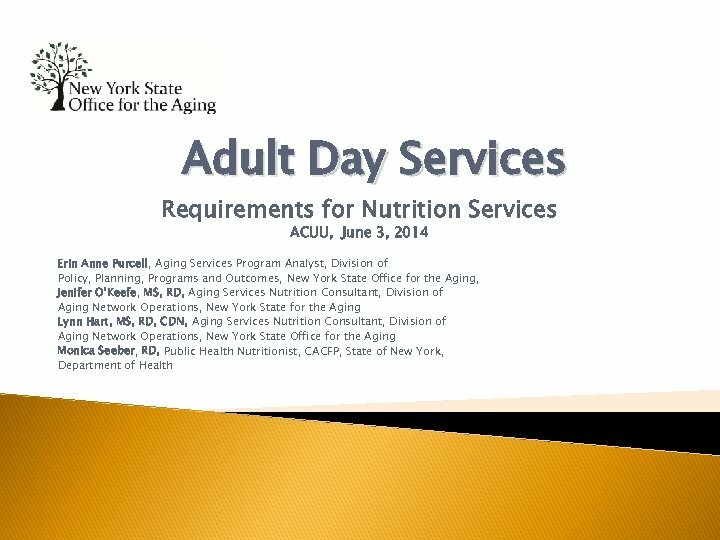 Learn about the requirements in NYSOFA’s nutrition regulations and how to participate in the Child and Adult Care Food Program (CACFP). 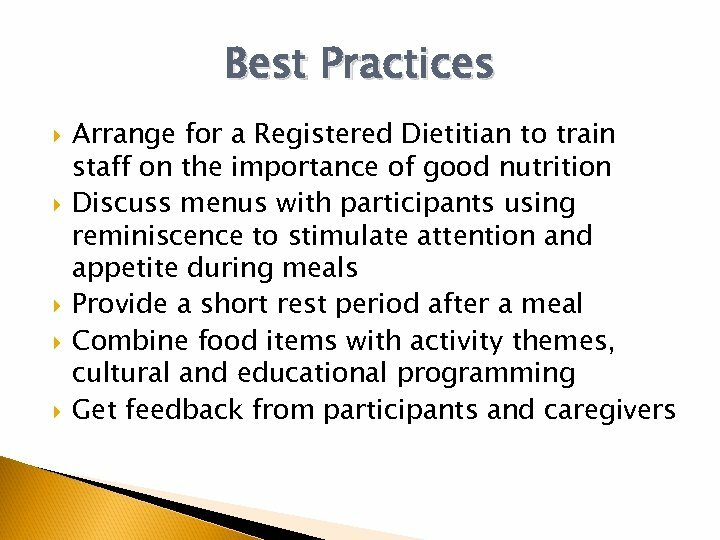 Take away best practices and sample menus. 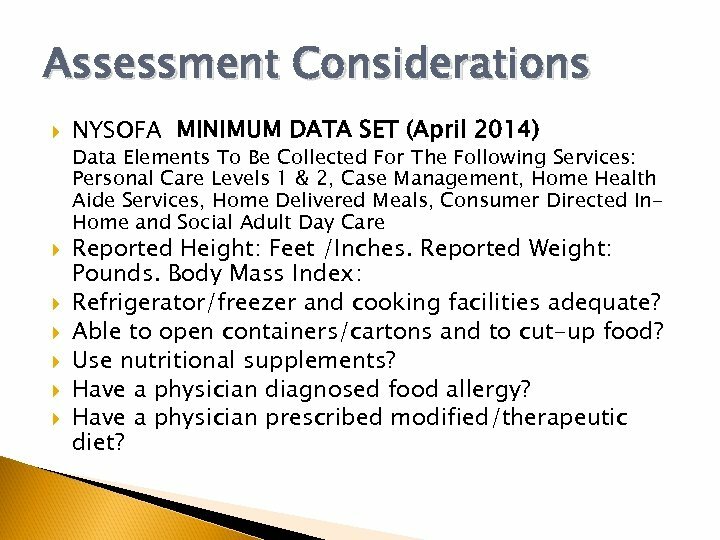 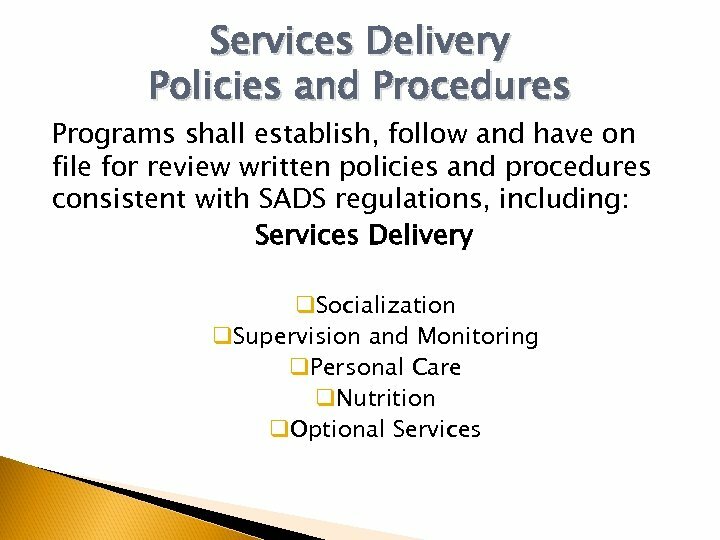 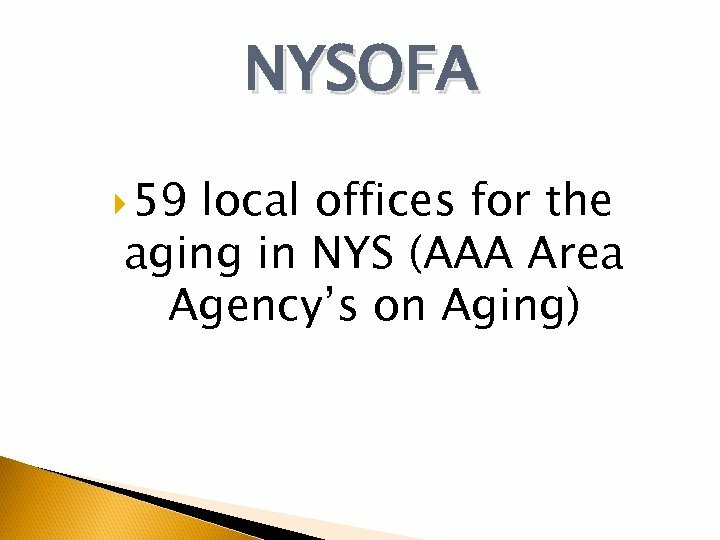 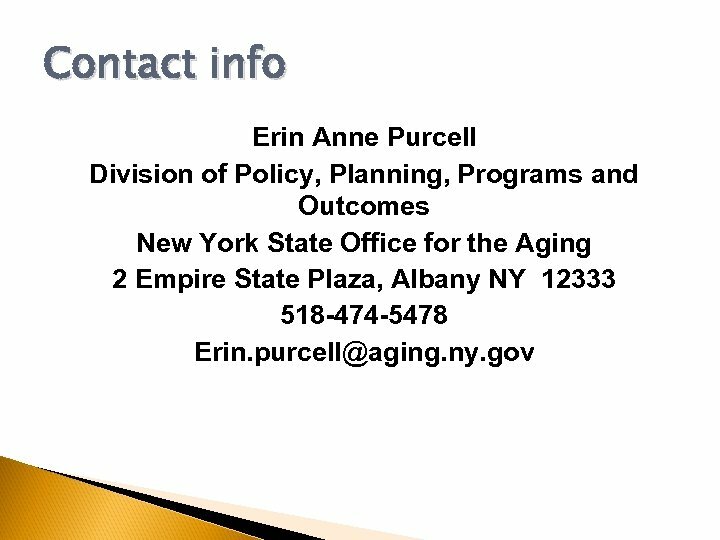 Assessment Considerations NYSOFA MINIMUM DATA SET (April 2014) Data Elements To Be Collected For The Following Services: Personal Care Levels 1 & 2, Case Management, Home Health Aide Services, Home Delivered Meals, Consumer Directed In. 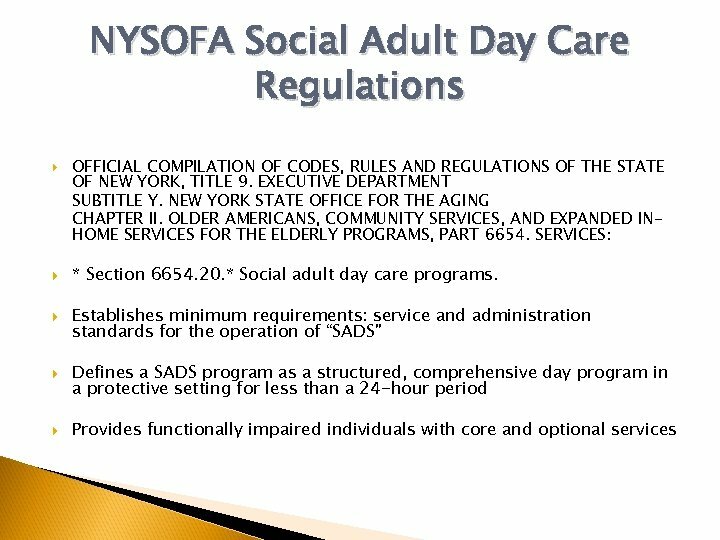 Home and Social Adult Day Care Reported Height: Feet /Inches. 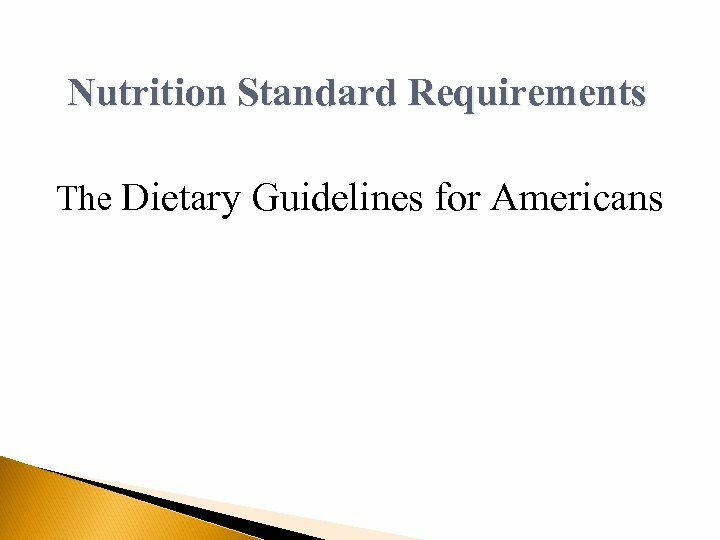 Reported Weight: Pounds. 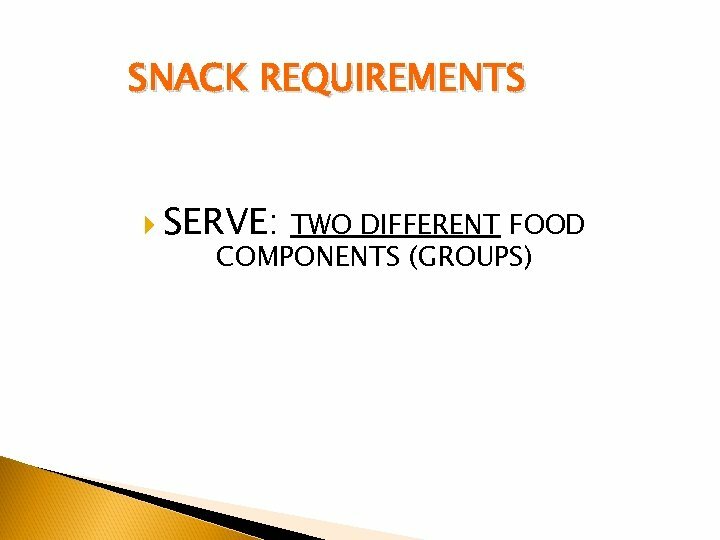 Body Mass Index: Refrigerator/freezer and cooking facilities adequate? 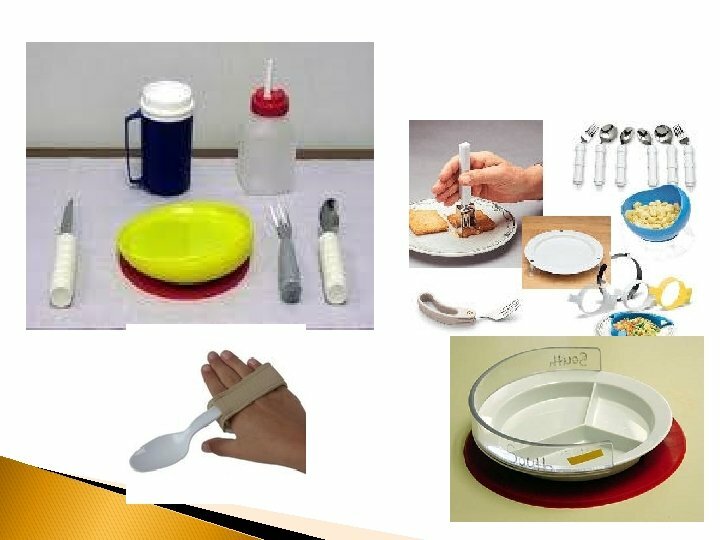 Able to open containers/cartons and to cut-up food? 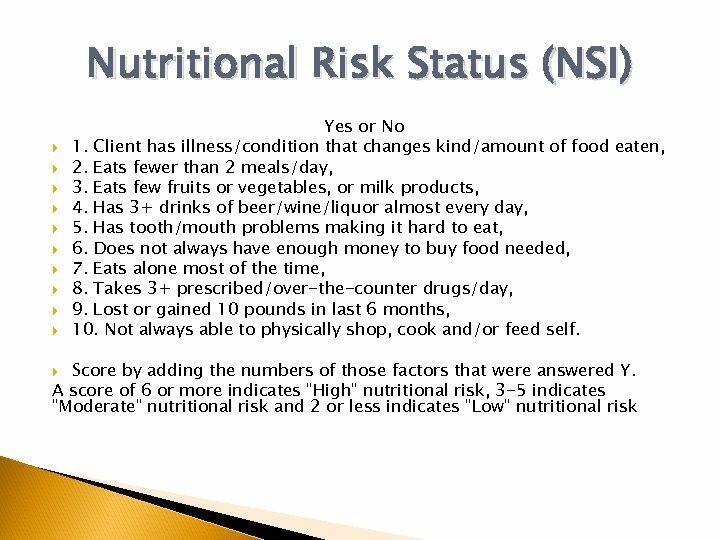 Use nutritional supplements? 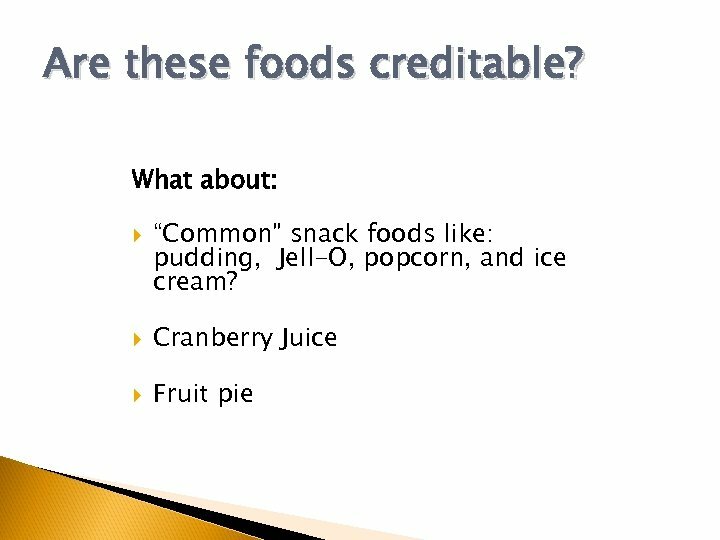 Have a physician diagnosed food allergy? 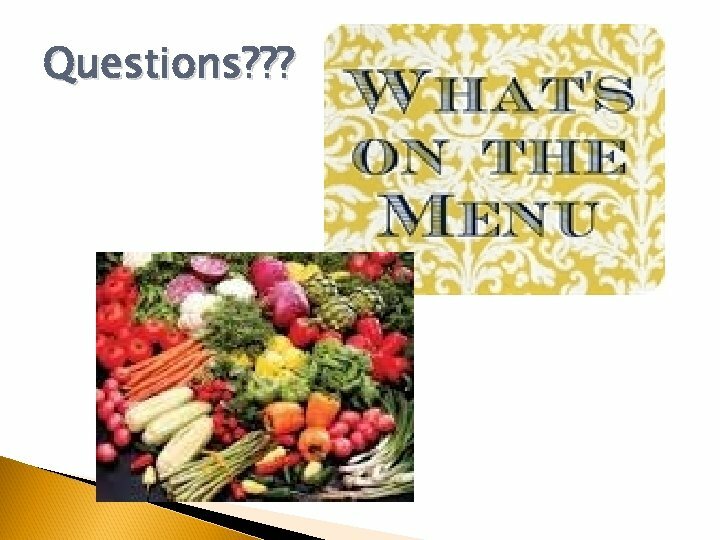 Have a physician prescribed modified/therapeutic diet? 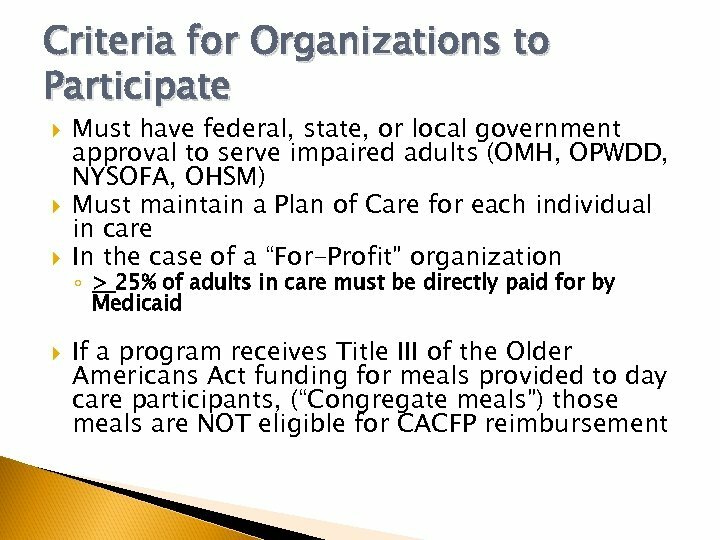 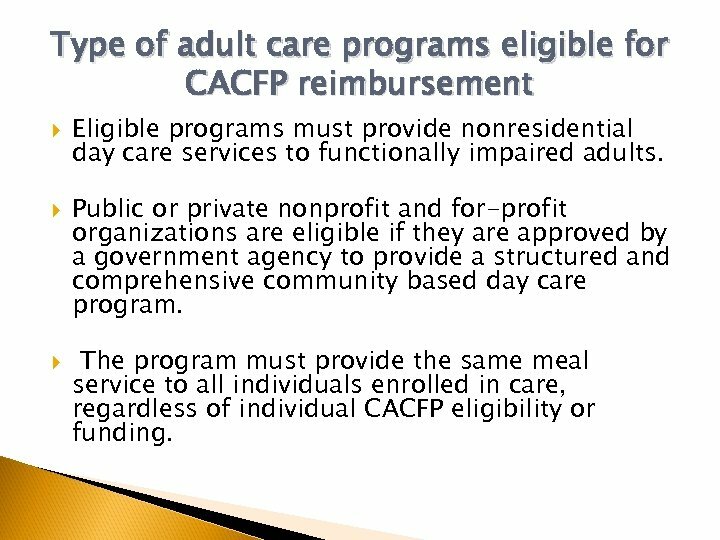 Type of adult care programs eligible for CACFP reimbursement Eligible programs must provide nonresidential day care services to functionally impaired adults. 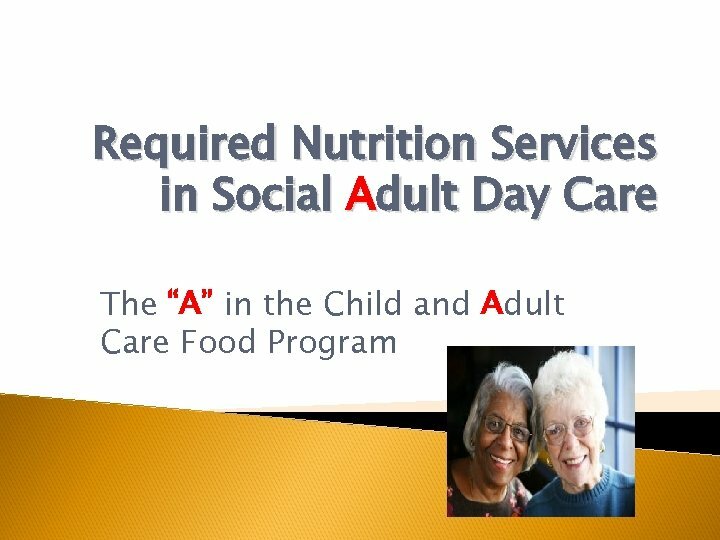 Public or private nonprofit and for-profit organizations are eligible if they are approved by a government agency to provide a structured and comprehensive community based day care program. 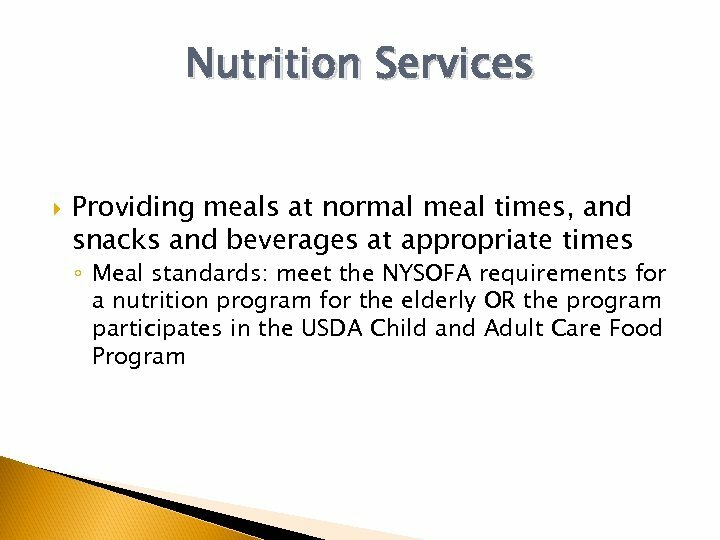 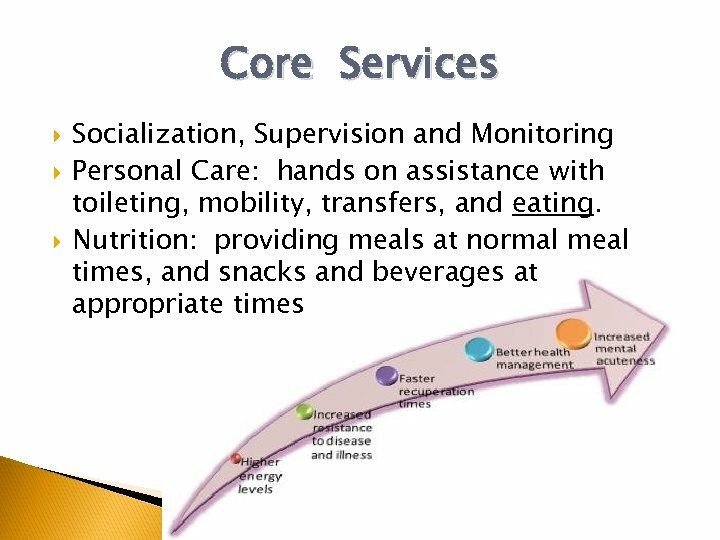 The program must provide the same meal service to all individuals enrolled in care, regardless of individual CACFP eligibility or funding. 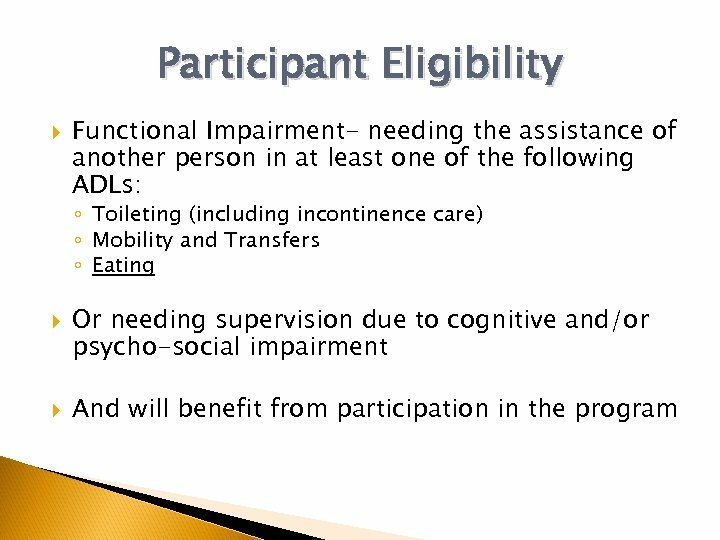 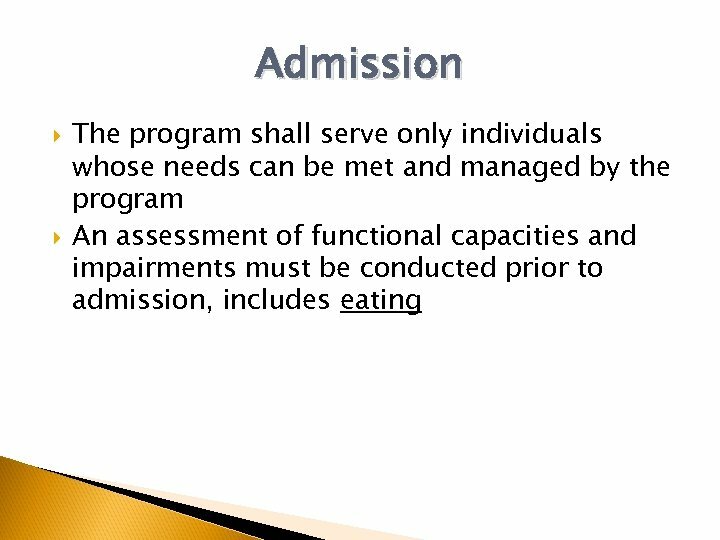 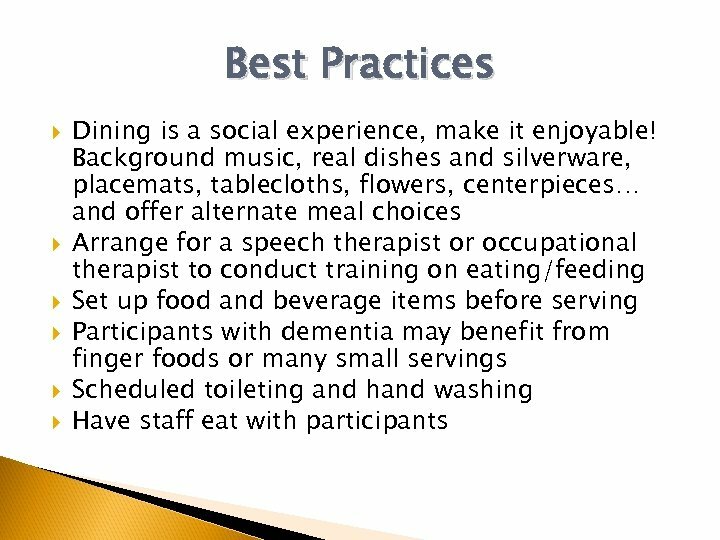 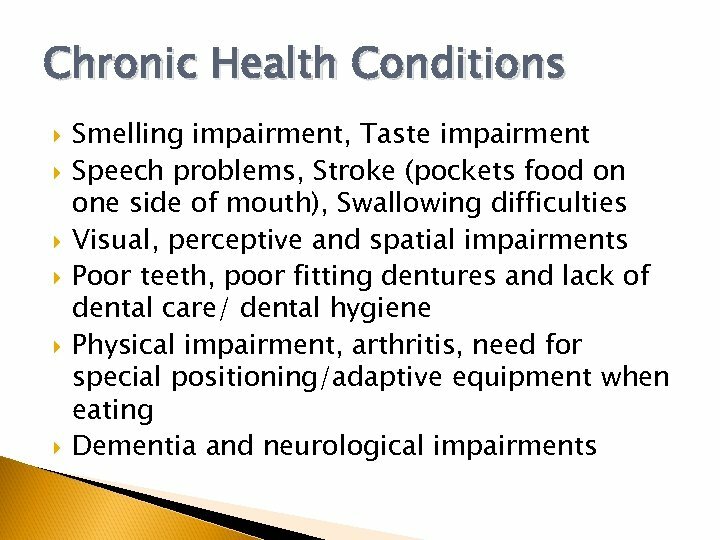 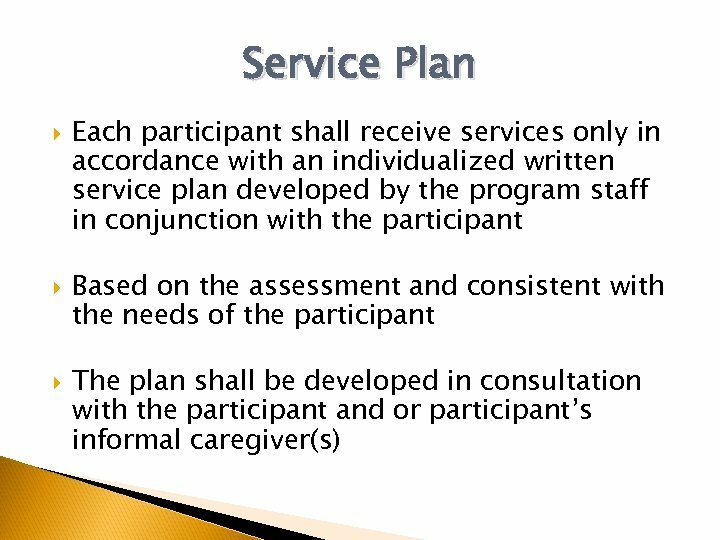 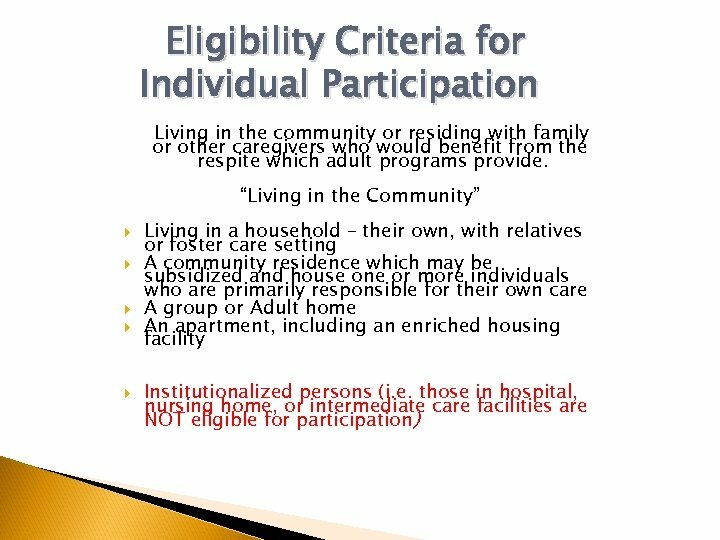 Examples of programs (eligible and ineligible) Eligible – day treatment programs or day habilitation programs serving mentally or physically disabled adults, or programs serving people with Alzheimer’s disease. 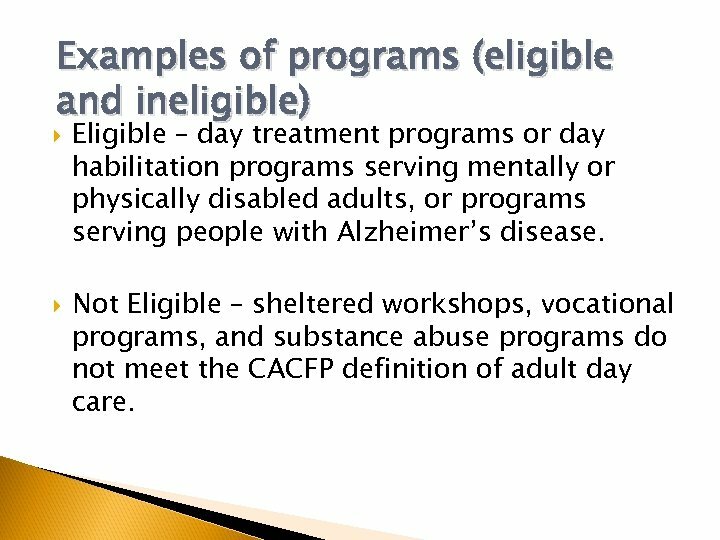 Not Eligible – sheltered workshops, vocational programs, and substance abuse programs do not meet the CACFP definition of adult day care. 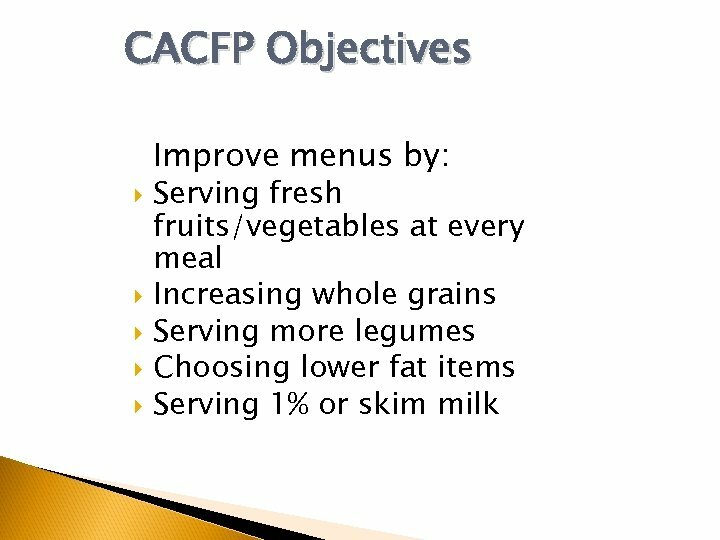 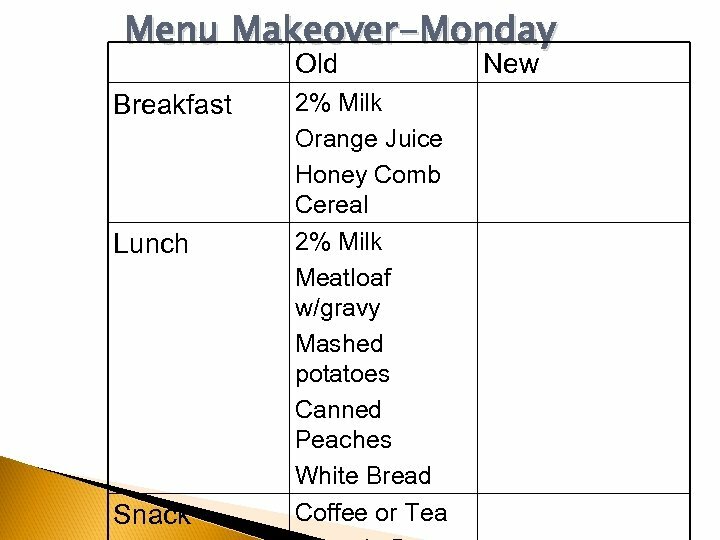 Meal Service in a nutshell: Serve meals that meet the CACFP HEALTHY MEAL PATTERN requirements for Adults. 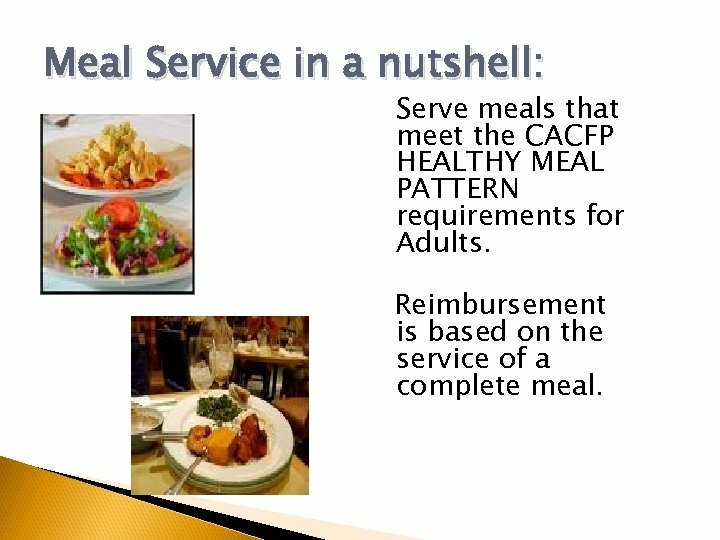 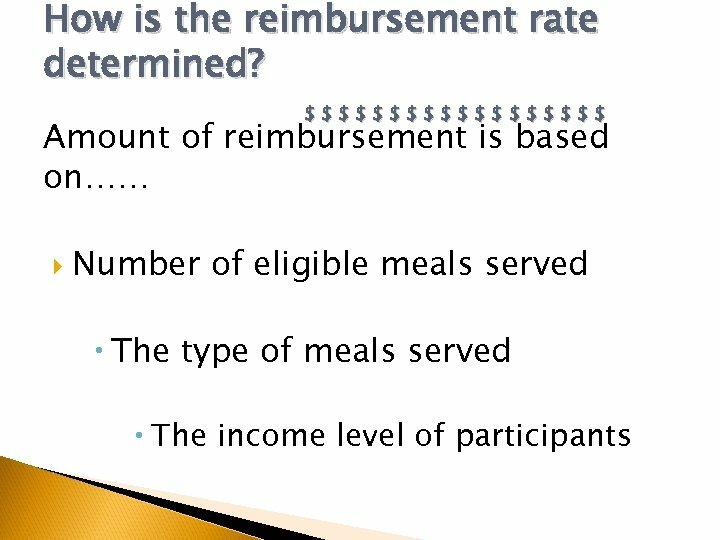 Reimbursement is based on the service of a complete meal. 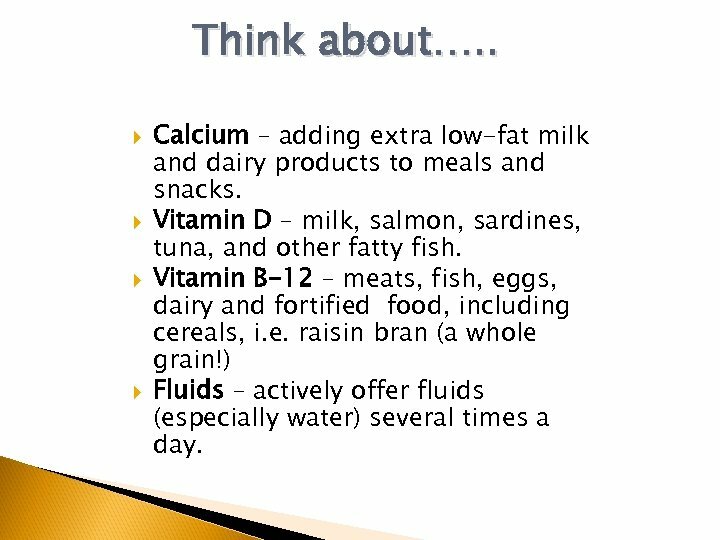 Think about…. . Calcium – adding extra low-fat milk and dairy products to meals and snacks. 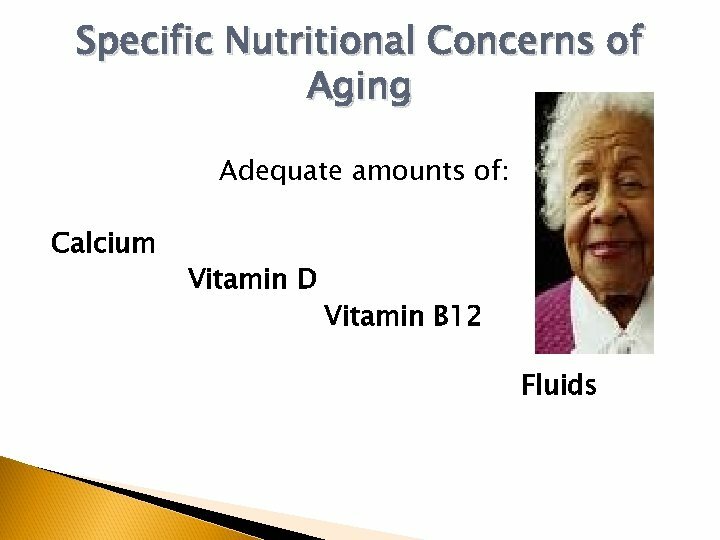 Vitamin D – milk, salmon, sardines, tuna, and other fatty fish. 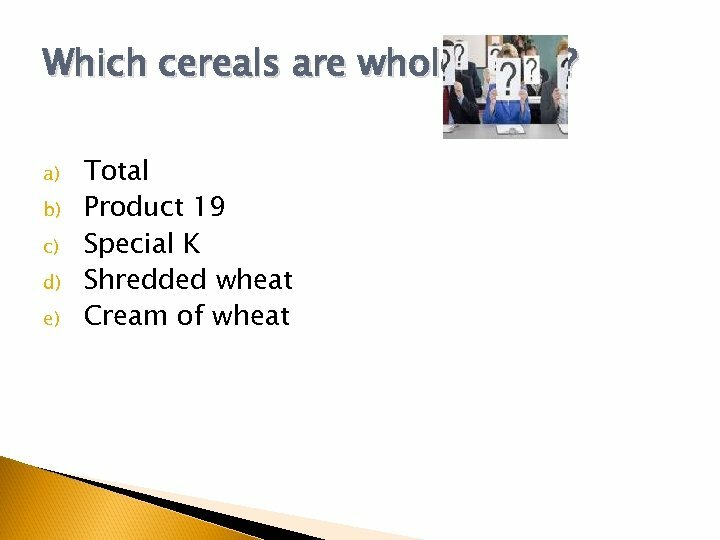 Vitamin B-12 – meats, fish, eggs, dairy and fortified food, including cereals, i. e. raisin bran (a whole grain!) 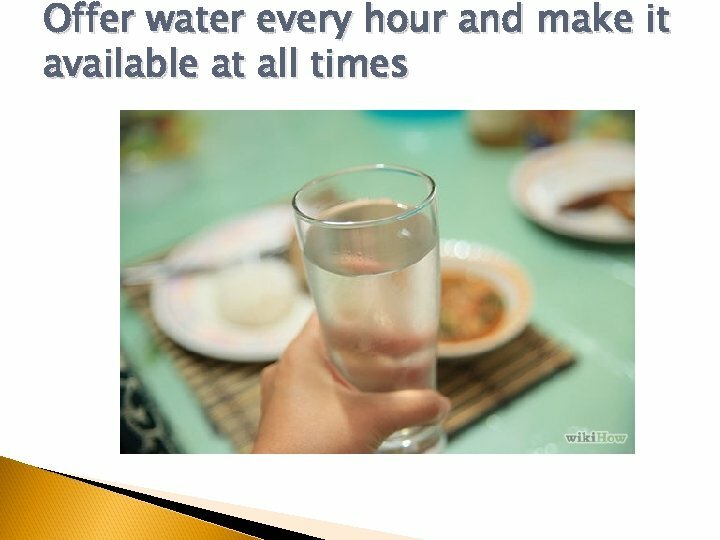 Fluids – actively offer fluids (especially water) several times a day. 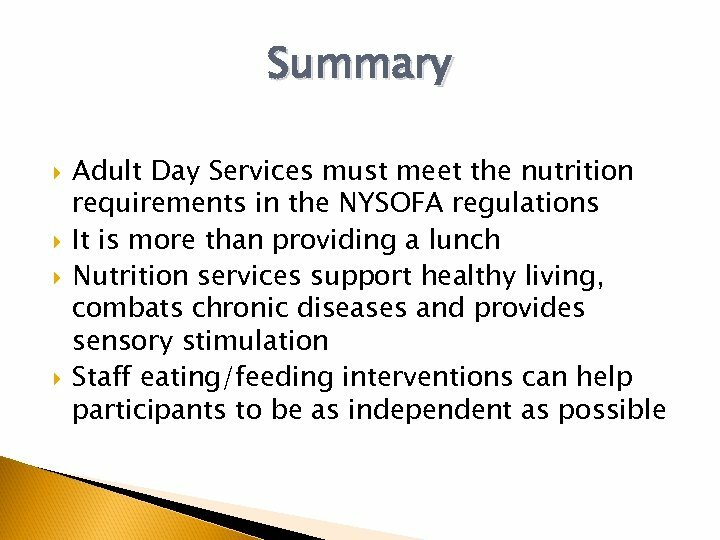 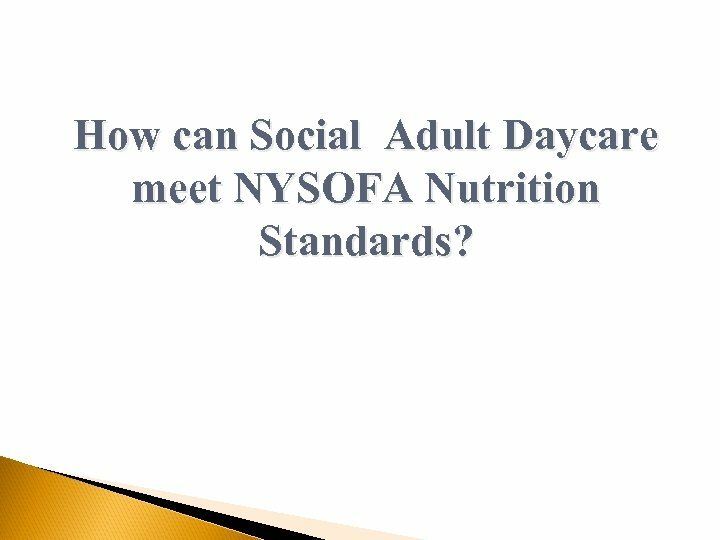 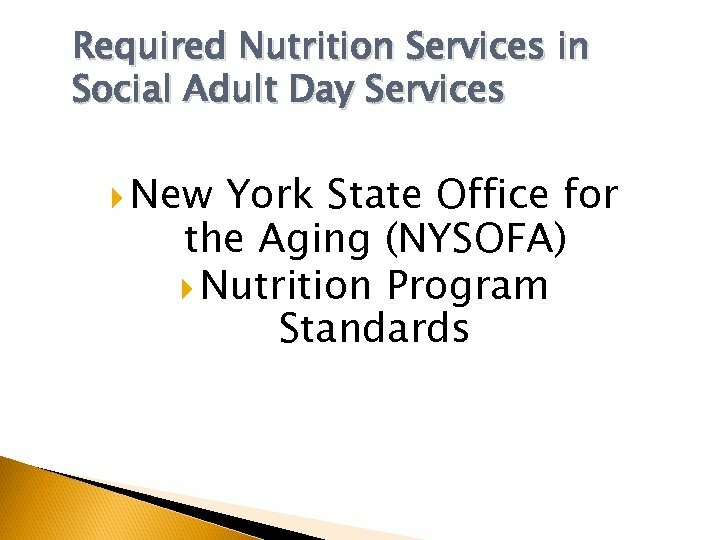 How can Social Adult Daycare meet NYSOFA Nutrition Standards?